Participants in Emory's recent Fitbit pilot program walked the equivalent of eight times around the globe. 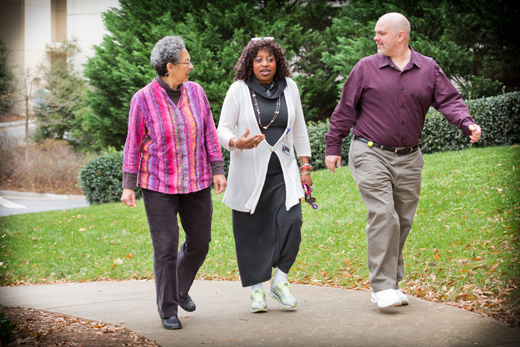 In August, the Move More Challenge will open up to all Emory employees. To encourage employees to increase their physical activity and adopt healthy behaviors, Emory will soon offer all employees the opportunity to receive a Fitbit fitness tracker at a reduced cost. Registration for the Move More Challenge will begin in August. Fitbit is a wearable mini-computer that gathers data about a person's activity and body, such as number of steps, distance traveled and calories burned. "Studies show that people who keep track of their activity are the most successful at reaching their health and fitness goals," explains Michael Staufacker, director of health management. "The decision to expand the Move More Challenge to all employees is based on the success of a pilot program that was developed last fall as part of the Healthy Emory initiative," Staufacker says. The eight-week pilot program, held Sept. 22 through Nov. 17, invited employees from five different Emory sites to participate: Emory Johns Creek Hospital, Decatur Plaza, Peachtree Center, Yerkes (Main Station and Field Station), and the 1599 Building. More than 1,200 employees from these sites registered for the challenge and each used a Fitbit to track their physical activity. The data collected from each participant's Fitbit was regularly uploaded into an online program allowing them to track their own daily, weekly and monthly progress. They were also able to see the average steps of each building site which encouraged a little healthy competition. Using the Fitbit helped the challenge participants by providing them with a real-time awareness of how physically active they really were each day. David Wynes, vice president for research administration, participated in the program at the 1599 Building. "The challenge was extremely successful in building the awareness of how both minor and major lifestyle changes can improve your fitness," Wynes says. Throughout the entire Move More Challenge, there was a definite buzz of excitement and activity in the different sites. "Staff began to walk more at lunch and also take the stairs around the building, and others walked down the hall to have a discussion about an issue rather than sending an email," Wynes notes. Nurses from the Endoscopy Department at Emory Johns Creek Hospital noticed staff walking the halls instead of sitting while waiting for cases to get started. "This challenge helped me choose to spend time exercising instead of sitting — it really did make me more active," says participant Sondra Russ, an EJCH nurse. Participants received weekly emails with educational and motivational messages to keep them engaged in the challenge. Prizes were also given to participants who met certain milestones, such as 10,000 steps daily. Staufacker explains that Emory reviewed aggregate data from pilot program participant feedback surveys and the Fitbit activity logs to decide whether to expand the program to all employees. "This program fits within the Healthy Emory strategic plan which focuses on three key areas: increasing physical activity; improving healthy eating and nutrition; and enhancing stress management skills," he says. Information about how to register for the Move More Challenge will be posted on the Faculty Staff Assistance Program website later this summer.